We are big fans of pot pie. It’s all about the crust, I’m sure, but there’s also something deeply satisfying in a one-dish dinner. I most often make chicken pot pie from our leftover roast chicken, but when it’s Meatless Monday, I make one critical substitution. 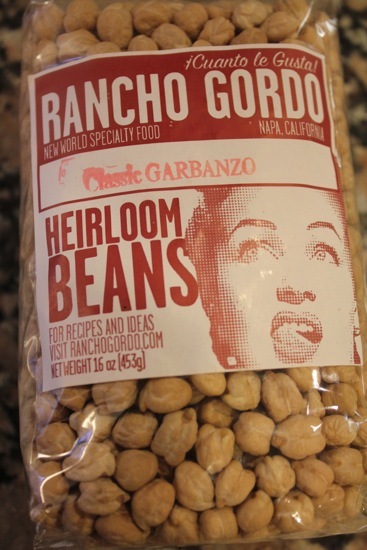 Chick peas, or garbanzo beans, are a great source of protein. They are flexible in the kitchen – try them pan fried as an appetizer, added to a salad, or roasted alongside cauliflower, then stirred into an Indian-spiced sauce. Or, make this twist on an old favorite. Melt the butter in a deep, wide pan. I use a saucier. Allow the butter to foam, then begin to slightly brown. Add the pearl onions and cook them in the browned butter until they begin to color. Sprinkle with the sugar and cook until caramelized. In the same pot, heat the butter until foamy, saute diced carrots and celery until softened, add in the mushrooms, stir once and then allow the mushrooms to cook without stirring for about 6 minutes, until they have released and reabsorbed their liquids. Add the caramelized onions, then sprinkle the flour over all the vegetables. Stir to coat the vegetables, then brown the flour until it stops smelling like flour. Voila. A roux. Add chickpeas, herbes and lemon zest, then the wine. Reduce wine by half. Add 3 c broth. Bring to a boil, reduce heat and simmer for 10 minutes. Taste for seasoning. Remove from the heat. Pour the mixture into a deep dish pie pan, a 3 qt. casserole, or individual serving dishes. 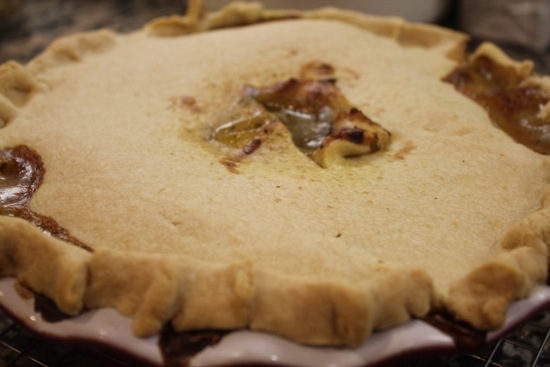 Cover with pie crust and crimp the edges. If you have time, refrigerate to chill the crust. A cold crust is always flakier. I never seem to make the time to do this. Bake at 425° for 20 minutes, then reduce the heat to 350° for 40 minutes, or until the filling is bubbling and the crust is browned. Nice dish for our veggie friends. What is turbinado sugar? Why use it instead of the norm? Getting ready for our next big snow storm!! It never occurred to me to use chickpeas instead of chicken, but this looks delicious. I’ll have to try it soon! Happy accidents! I pressure canned chickpeas yesterday but the some of the seals failed (I am still finessing those new Tatler lids!) so I had about 3 quarts of chickpeas to start using up! I remembered seeing your recipe for a Meatless Monday pie. You know what they say…when in Rome…make chickpea pie! Pastry crust was wonderfully flaky and the pie was delightfully delicious. I am so totally surprised that a chickpea can have such flair! Thank you. I’ve had disappointments with the Tatler lids, too. I want to use them, but I had to throw out 4 qts of chicken stock last week, and I’m really mad at Tatler now! Glad you liked the pie. It’s one of our favorites. Pot pies are things I make all the time, with or without meat. I love using chickpeas, they don’t get as mushy as other types of beans. I generally find I don’t need or want to add extra sugar, though. Looking forward to a bunch of pot pies in the near future! Looking forward to making this for our book club. Could you recommend a salad to go with this? Hi Dana, At this time of year, I tend to make winter salads with endive, fennel and radish – all sliced thin, then tossed with a simple lemony vinaigrette. Alternately, consider mache or frisee – both lovely winter greens.